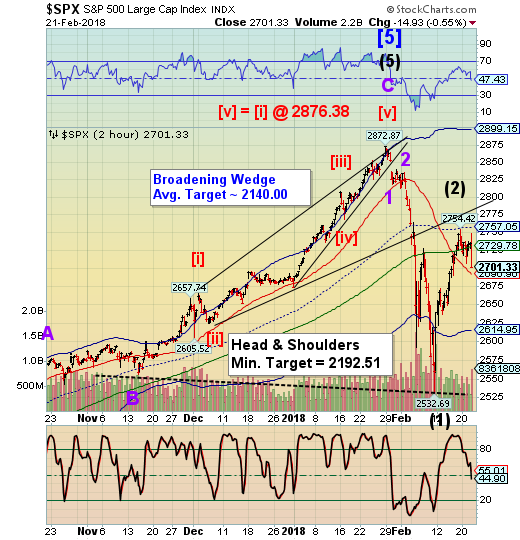 SPX had a bearish outside reversal yesterday. There is a slight difference between an outside and key reversal. 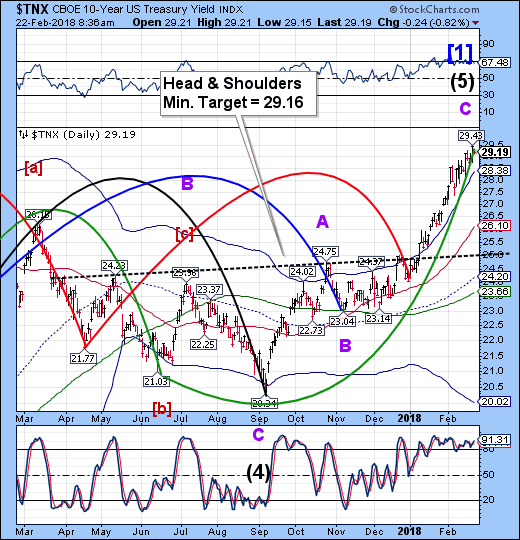 The key reversal happens at the peak of the rally, while an outside reversal may have a lower high. Both appears to be equally bearish in these circumstances. SPX futures bounced in overnight trading, suggesting a possible retracement as far as the 50-day Moving Average at 2729.78. Short-term support/resistance has performed a death cross with the mid-Cycle and 50-day. You can see that a violation of Short-term support is like opening the trap door. ZeroHedge reports, “Global stocks took another leg down during the early part of Thursday's session, sliding to one-week lows in the wake of Wednesday's unexpectedly market-moving FOMC minutes which confirmed the Fed was on track to raise interest rates several times this year, sending bond yields to new multi-year highs amid prospects for 4 rate hikes on deck (and according to Goldman, even 5 possible). Here’s some food for thought. The SPX/VIX ratio has declined by nearly 70% at its low on February 9. However, it is not finished with its decline. 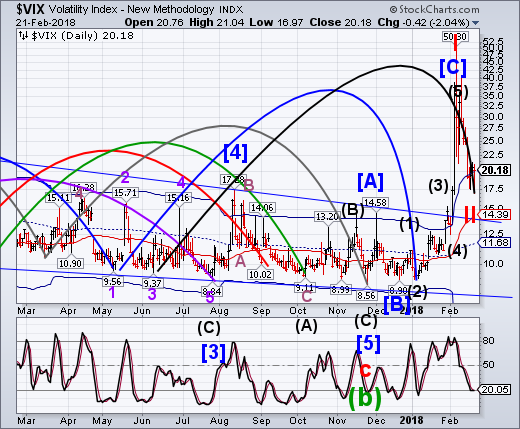 Should the VIX only revisit 50.00, SPX would have to decline to 1000.00 just to reach the lower trendline of the smaller Broadening Wedge. 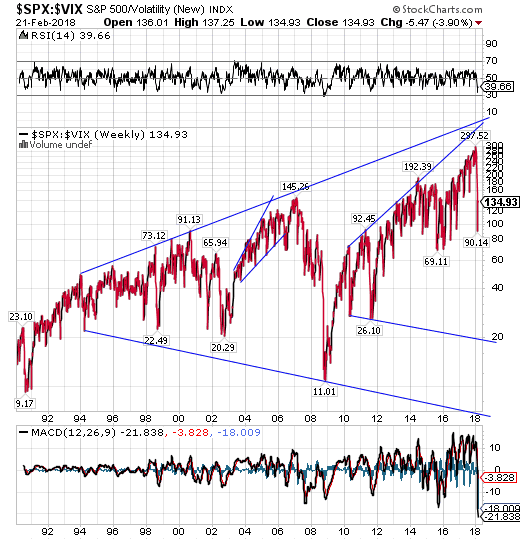 In order to revisit the lower trendline, the SPX/VIX ratio would have to be in single digits, since it dropped to 11.01 in 2008. TNX futures are flat this morning, trading in a range between 29.11 and 29.48. There is some confusion between UST and TNX. You would think that they are exactly inverse to each other. However, TNX is indicating the top of its Master Cycle possibly occurring early next week, while UST isn’t expecting its Master Cycle low until the week of March 19. It is likely that they may meet somewhere in between, but may keep us on tenderhooks until the turn is finally in. It appears that the 30.00 level is key and both bulls and bears are contemplating the consequences of any move above it. VIX futures are back beneath the Cycle Top at 19.97 this morning. Yesterday was day 257 of the current Master Cycle and it may have been the low at 16.97 for this Cycle. The usual rally out of the low takes an average of 21 days. This matches well with the next probable Master Cycle low in the SPX.